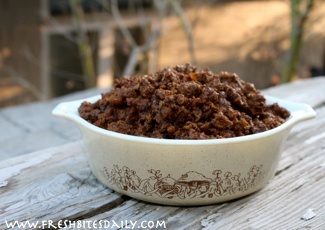 “Taco Meat” is the name we have given this savory ground beef recipe that we use in a variety of ways. Certainly, this meat is great right inside of a taco. However, we also pile it on black beans and then top all with a fresh tomato salsa. One of our favorite uses is what we call “Enchilada Salads,” a prized creation of my mother, who tops a bed of greens with enchilada goodness — taco meat, enchilada sauce, tomatoes, onion, and olives. In any case, it all starts with a good taco meat recipe which you can find here. You can also keep a taco seasoning on hand to make this project extremely simple. Fry the garlic and bay leaves for almost one minute and then add the onions. Fry until the onion is limp and just beginning to brown. Add the ground beef, breaking it up with the spatula and stirring it into the onion mixture. Stir occasionally as it cooks. Your meat is now ready to use in a variety of ways. Try doubling or tripling this recipe so you have plenty for later. 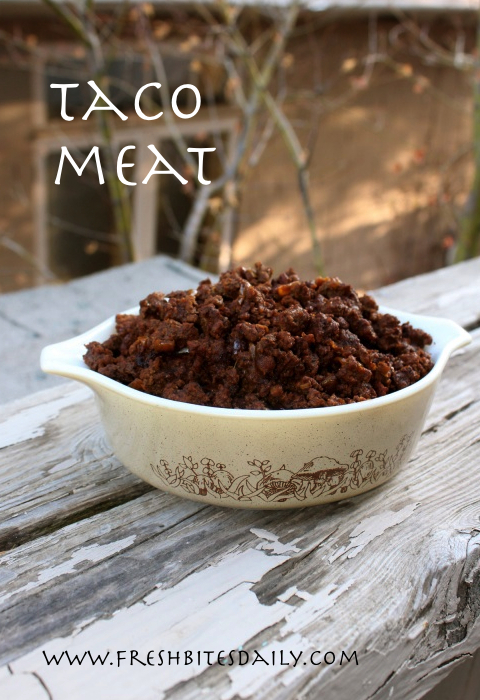 This taco meat recipe will keep for a week if it is well-refrigerated. This is also an exceptional recipe to freeze in usable quantities for later. We almost always make up this taco meat recipe in bulk and save much of it for later. 5 Comments on "A simple taco meat recipe that is wonderfully versatile (with a pro tip)"
Your instructions say to add the “chili powder”,(step 4) but I don’t see chili poweder listed on the ingredients. How much chili power is added to this recipe? As an added health benefit try using half ground beef and half ground turkey, it has nice savory flavor.I don’t bother frying the onions I add them into the meat and add a small amount of water and drain when done. This helps with the breakdown of the fat in the meat.i also use granulated garlic,thus eliminated the need for the extra oil.I would use two tablespoons of chili powder for this quantity of meat. I love the fact that you’re adding more than just meat to your taco recipe. So many people are so afraid of seasoning meat and then they wonder why their tacos taste so bland. This is great! My kids always love taco. Do you have tips to keep it well in refrigerator? How to keep the flavor, taste and off course keep it looks attractive for kids?